Did you know the online gambling industry is one of the biggest in the world, with billions of pounds being generated every year? There are people that play casino on Paddy Power every day, games such as blackjack and poker, in an attempt to win some money. However, there are others who aren’t the biggest gamblers and prefer to play gambling simulation games instead. Due to the emergence of online casino sites, there has been very little demand for any new casino simulation games to be released. This is because players are now able to play against each other in real time and they are able to test their strategies on simulation websites which are free. Although there haven’t been many casino video games that have been released recently, there are still a couple of retro games that have been released over the years which you have to try! Draw poker is one of the simplest versions of poker around and is also the first type of poker variant learnt by new players. At the start of the game each player is dealt a complete hand of five cards. The player can then develop their hand throughout the game by replacing them with cards from the pack. Usually there are two drawing rounds where players can replace their cards, but there can be fewer if all but one player folds before the first round. If there is more than one player remaining after the two drawing rounds, then a showdown occurs when the player with the best hand wins. With poker variants, such as ‘Texas Hold’em’, being preferred by professional poker players, it is very rare that you’ll see draw poker being played at a casino table or in a professional tournament any more. Fortunately for those who still prefer playing this type of poker, the majority of casinos tend to have video poker machines available where the rules are based on the simple mechanics of five-card draw poker. Away from the casino floor, our next retro game is ‘Vegas Stakes’. 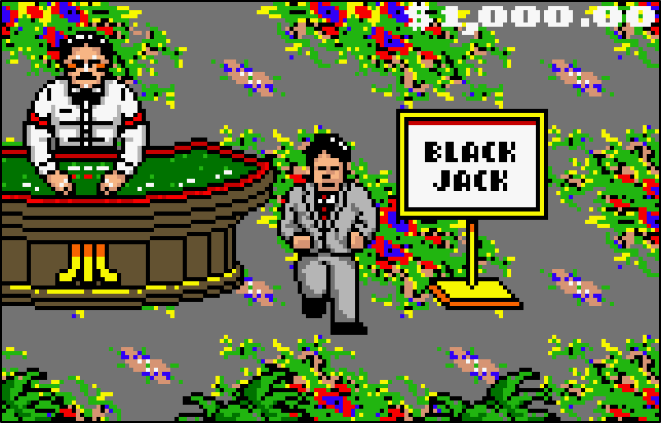 This game, released in 1993, is arguably one of the most iconic gambling video games of all time. As the name suggests, the game starts off with the player going to Las Vegas to gamble with $1,000: it is the player’s goal to win $10 million by playing the different games available in the game. Vegas Stakes comprised five games – craps, roulette, blackjack, poker and the slot machines. From the beginning there are four casinos unlocked with the fifth one becoming unlocked when the player reaches $100,000. The casino you’re playing in also determines how much you were able to bet. For example, the ‘Hideaway’ casino only allowed small bets whilst ‘Laurel Palace’ allowed high bets. There was also a multi-player mode included in the Super NES version of the game which was exactly the same as the single player mode, but you weren’t able to play poker because you’d be able to see everyone else’s cards! 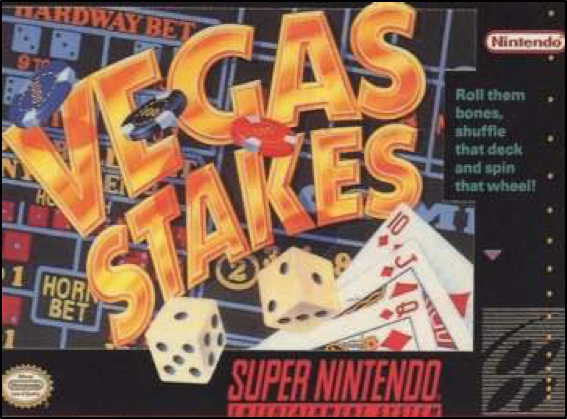 Although Vegas Stakes was released in 1993, there have been very few games since then that have managed to replicate the casino experience as well as this game did. 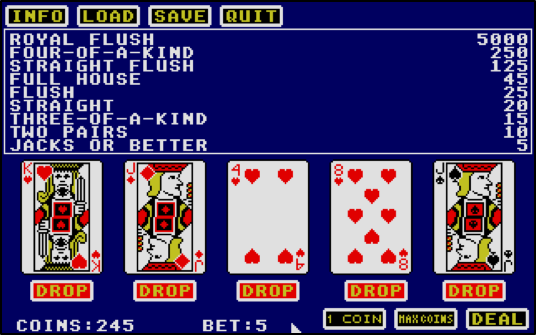 In 1992, Lynx Casino was released on the Atari Lynx. While many casino games during this period tried to replicate the entire Las Vegas experience, the creators of Lynx Casino focused all their efforts on creating the best gambling simulator possible. In total there were five casino games the users were able to play – blackjack, craps, roulette, slot machines and video draw poker. Although the number of casino games featured was fewer than some other casino games at the time, there were options and features which simply weren’t available on some of the other games at the time. Authentic rules, odds and pay-offs for each game were implemented as well as the same options that its real-life counterpart offered. For example, the craps game-mode supported the usual Pass/No Pass all the way to Hard Way and Horn Bets. Another impressive feature of the game was the statistic tracking. Statistics were kept each game session so that the players were able to analyse their playing skill and discover areas which they could improve. The inclusion of this feature meant that professional players and experts were able to practice or create gambling techniques, whilst casual players were able to have fun just placing some bets. Although this game didn’t have ‘gimmicky’ features like other casino games, Lynx Casino gave players a streamlined version of the casino experience that allowed players to practice and refine their strategy in a couple of popular casino games. Compared to the other games featured in this list, ’Hard Rock Casino’ isn’t as retro as the others. Released in 2006, Hard Rock Casino combined twenty of the most popular casino games, including blackjack, craps and roulette. Gaining inspiration from Vegas Stakes, each player started with $1,000 and it was the player’s job to win as much money as possible by playing the different game-modes available. There was no set limit for the amount of money which you had to earn, but the major goal of the game was to become the ‘Hard Rock High Roller’. The main appeal of the game came from creating your own unique character and trying out the different casinos in which you were able to play. Like Vegas Stakes, Hard Rock Casino had multiple uniquely designed casinos you could play in where different stake limits were applied. However, Hard Rock Casino also implemented different house rules, tables and games in each casino, offering some variety to the players instead of playing the same game over and over. Despite trying to offer a different kind of casino video game experience, Hard Rock Casino wasn’t that well received, but did receive plaudits for its attempt to offer something new to the casino video game niche. With the emergence of online casino sites, casino video games aren’t as popular as they once were. There is a slight chance that we might see some new casino and gambling games released in the future thanks to AR and VR becoming more mainstream, but so far nothing has been announced. Even if there isn’t a sudden influx of new casino games in the coming year, gambling fans still have plenty of casino-based video games to play.